The U.S. is in the midst of a significant long-term shift in both the size and profile of its veteran population. 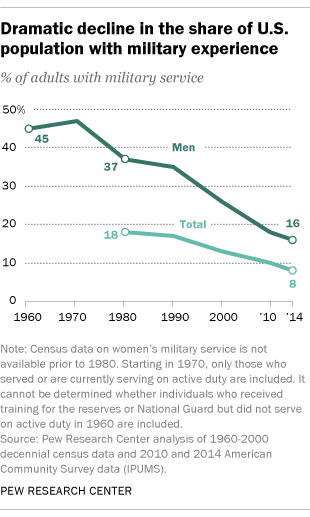 The share of the population with military experience – counting those who are on active duty or were in the past – has fallen by more than half since 1980. Then, 18% of adults were serving or had served in the military. By 2014, the share had declined to 8%, according to Census Bureau data, with an additional 1% serving in the reserves. Among U.S. men, the decline was even more dramatic, dropping from 45% in 1960 to 37% in 1980 and 16% in 2014. The number of people currently on active duty has also dropped significantly in the past half-century, falling from 3.1 million in 1966 – during the military draft era – to 1.3 million in today’s all-voluntary force, less than 1% of all U.S. adults. However, the decline in the share of the population with military experience has been driven primarily by the shrinking number of U.S. veterans as many pass away. 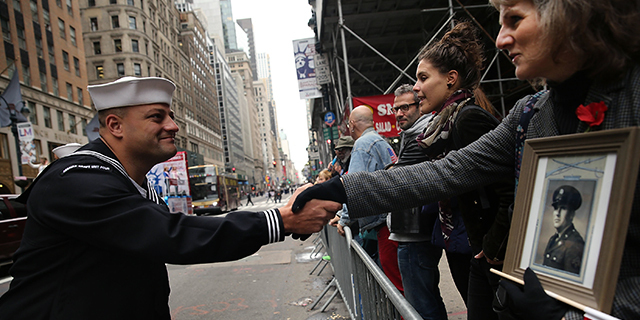 In 1980, 18% of U.S. adults were veterans, compared with 8% in 2014, according to census data. About 7 million (32%) of the 22 million living veterans in 2013 served during the Vietnam War era, according to data from the Veterans Administration (VA). An additional 30% served during the Gulf War era, but far smaller shares of living veterans served during the Korean War (9%) or World War II (5%). In the years to come, the profile of veterans will continue to shift. VA projections suggest that by 2043, the total number of U.S. veterans will have dropped to about 14.5 million. By that time, most of those who served in the Vietnam era and earlier will have died. Gulf War-era veterans will likely comprise the majority of all vets, based upon the VA model, while those who served since the Gulf War are projected to account for a quarter of the veteran population. 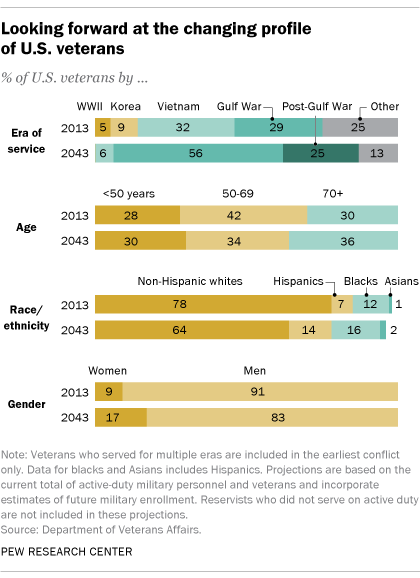 The demographic profile of veterans is also expected to change in the coming decades, reflecting the shifting demographic profile of the military in general. Between 2013 and 2043, the share of all veterans who are women will almost double, from 9% up to 17%, according to VA projections. At the same time, the share ages 50 to 69 is expected to shrink from 42% to 34%, while the share ages 70 or older is expected to rise from 30% to 36%. Mirroring trends in the overall U.S. population, the veteran population is predicted to become more racially and ethnically diverse, as well. Between 2013 and 2043, the share of non-Hispanic white veterans is projected to fall from 78% to 64%, while the share of Hispanic vets will likely double, from 7% to 14%.